Sacrifices are necessary for work-life balance, but how do your choices stack up to your peers? Find out how others prioritize their personal and professional goals. Finding the right balance between family, a job, and hobbies can be a constant struggle. From an early age, we are taught to give our all, 100% the time. But that just isn’t possible for people juggling work, family, hobbies, volunteering, and everything else on their plates. To achieve work-life balance, we make sacrifices. But what are individuals willing to give up to improve the quality of their lives? The simple answer for many is money, but how much and for which activities? But what are individuals willing to give up to improve the quality of their lives? The simple answer for many is money, but how much and for which activities? We surveyed over 1,000 employed people and examined the sacrifices they were willing to forego for personal priorities. Keep reading to discover how people of all ages are handling life and succeeding in the ultimate juggling act. 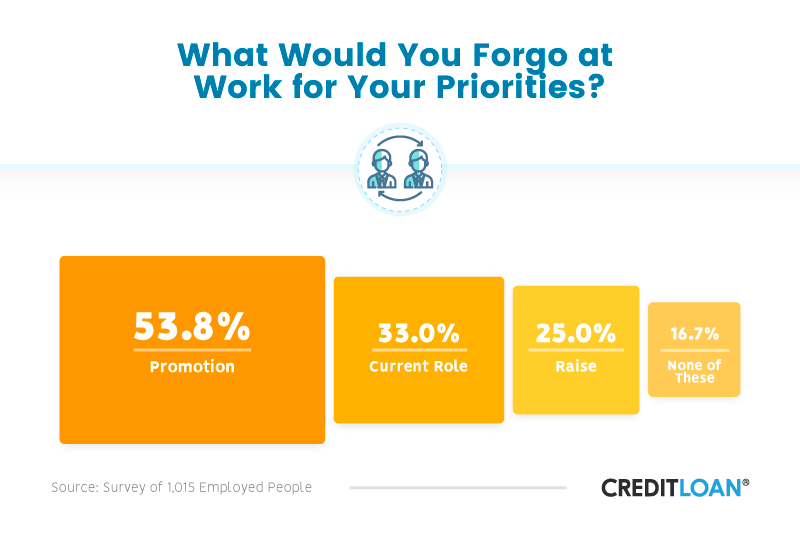 To make time for their priorities, over half of the people surveyed would forgo a promotion. This may be driven by changing attitudes toward work. Millennials, in particular, are concerned about work-life balance and no longer believe climbing the corporate ladder defines their success. Shifts in demographics show millennials make up the most significant share of the U.S. labor market, and their concept of the ideal workweek is dramatically different than that of their parents and grandparents. Promotions are one thing, but what about people's current jobs? Would they give up their current role to make time for something they value? It turns out that about a third of them would. Naturally, we write a great deal about the importance of personal finance and fiscal responsibility. While inflation and other factors contribute to a steady increase in prices and the cost of living, a quarter of those polled said they would forgo a raise to make time for high-priority desires outside of the office. Maybe the famous phrase, "Time is money," will be replaced with, "Time over money," or "Time matters more than money." Not everyone was willing to swap the trappings of success for other endeavors, though, with almost 17% saying they weren't ready to give any of these up. Let's turn the tables for a minute and see what personal sacrifices people were willing to make for their career. The key here is whether people were satisfied or dissatisfied with the work they performed. Depending on work satisfaction, the numbers paint a vibrant picture of what we may be willing to sacrifice. For example, over 57% of those satisfied with their work performance were more likely to give up time with friends, but less than 46% would sacrifice time for physical and health-related activities. 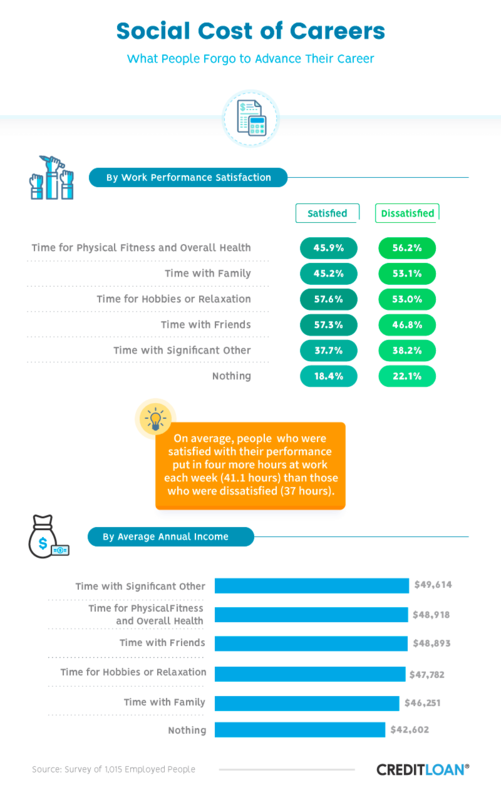 On the flip side, more than 56% of those dissatisfied with their work performance seemed more inclined to give up time for physical fitness and activities devoted to improving health, but nearly 47% would give up time with friends. Thankfully, those closest to us pay a smaller price for both groups. Only about 38% of both groups indicated time with a significant other would suffer. That's good news because managing relationships, family issues and working full time is a constant challenge in today's ultra-fast business environment. Additionally, those saying they hadn't sacrificed anything tended to earn less money. Sometimes making tough decisions at an early age can pay dividends in later years. Our relationship status and gender may play a significant role in finding the right work-life balance. Those who were divorced, separated, or widowed had the hardest time balancing work and priorities. They also tended to work longer hours. Often, spouses who have stayed home to tend to their family find themselves back in the workforce after divorce. When this happens, experts suggest making sure you find time to care for yourself and your needs to minimize the pressure of burning the candle at both ends. Others aren't immune to these challenges either. 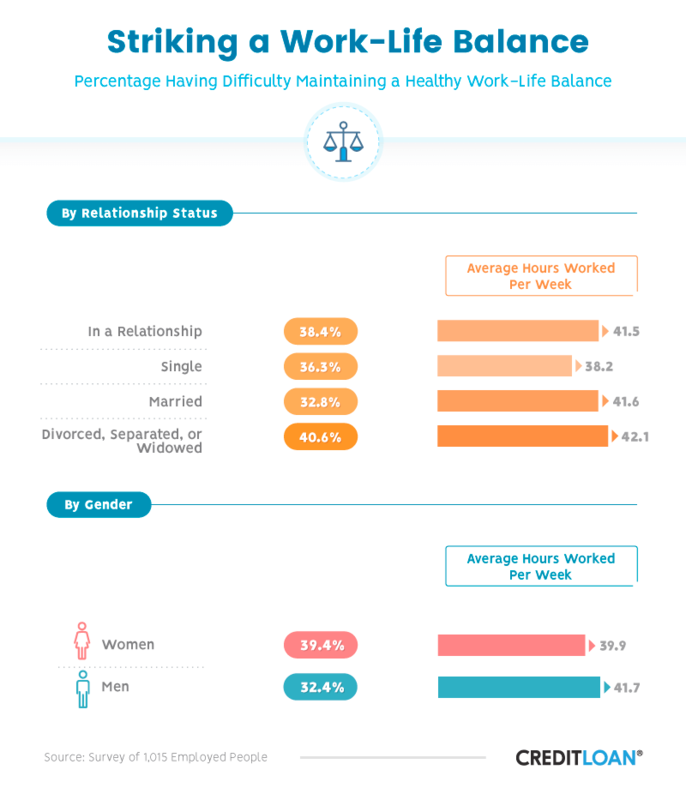 Women were more likely than men to say they found it difficult maintaining a balance between their work and personal life, although they worked fewer hours on average than men. For women, in particular, their work schedules can impact how successful they are at juggling multiple priorities. Women with more rigid work hours struggle more than their counterparts with flexible schedules, regardless of income or profession. It might be tempting to think finding the right work-life balance gets easier as we age. But that's not necessarily the case. Millennials, Gen Xers, and baby boomers all struggle with work-life issues. What does change is how we prioritize our time. 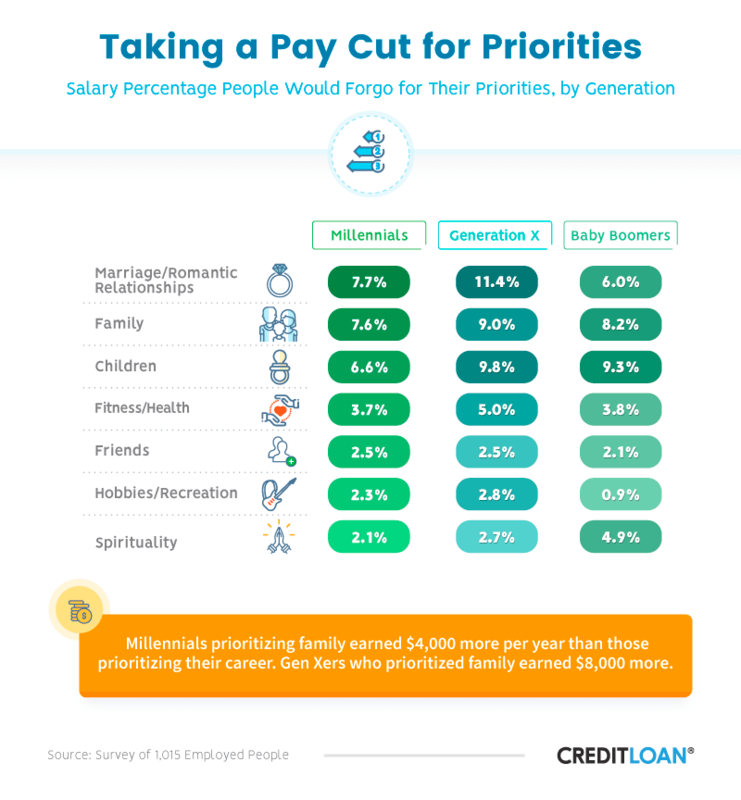 Millennials were willing to sacrifice only 7.7% of their salaries for family time compared to 11.4 % for Gen Xers and 6% of baby boomers. Along the similar lines, Gen Xers would take almost a 10% pay cut for their children, followed closely by baby boomers at 9.3%. Millennials in our survey said they would give up only 6.6% of their wages. This could surprise some given the average age of first-time birth mothers in 2016 is 28, a number that falls within the millennial age range of 22-37. On the other hand, millennial families look much different today than a more traditional baby boomer family. They are waiting longer to have children. Plus, the cost of childcare and education today are significantly higher today, meaning millennials are having a harder time financially than their parents. And given that a smaller percentage of millennials are getting married compared to other generations, this makes a lot of sense. However, according to our survey results, 22% of millennials without children still said their families came first. Another common theme among participants was proving they could have their cake and eat it too. Both millennials and Gen Xers who prioritized family also made more money. Our results show Gen Xers who spent more time with family brought home an additional $8,000 each year, and millennials an extra $4,000. Think about this for a second. Given the challenges of finding the right work-life balance, devoting more time to a vital priority can often translate into more income. Not a bad deal, huh? As for baby boomers, they placed a higher priority on marriage and children, as well as their family. The generation that ushered in the free love movement popular in the 1960s is turning to religion and spirituality in larger numbers as their generation ages. A recurring theme when people search for the ultimate work-life balance is family, especially their desire to spend more time with their children. 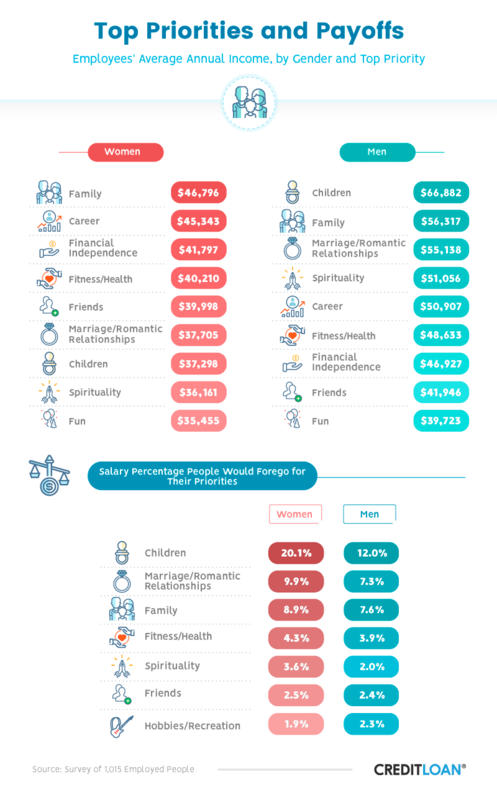 Women and men who said their family was a top priority had higher average annual salaries. To put this into perspective, men and women who said having fun was their top priority earned the least. For example, men who ranked family as their highest priority made an average of $16,594 more than men who valued fun as a priority. That's leaving some big dollars on the table. And speaking of giving up a few bucks, that's precisely what some people were willing to do to have more time with their kids and family. There are numerous examples of men and women experiencing 70- to 80-hour workweeks and attractive six-figure salaries loaded with the prospect of fame and fortune. In some cases, when children and family took precedence, many decided to forgo more complicated tax returns for more flexible and less demanding schedules. Women said they were willing to give up 20.1% of their annual salary – eight percentage points more than men – to spend time with their children. Working dads were still willing to give up 12% of their income to have more time with their children – the highest percentage of any category for men. Healthy relationships are such a vital component for humans. While it's not imperative that we are in a romantic relationship to be happy, studies suggest those who are experience less stress, have a healthier lifestyle, a greater sense of purpose, and a longer lifespan overall. We decided to peel back another layer and see what factors drove those in relationships or marriages. We broke this down by respondents who were satisfied and dissatisfied in their relationships, also including those who may have considered divorce as an option. 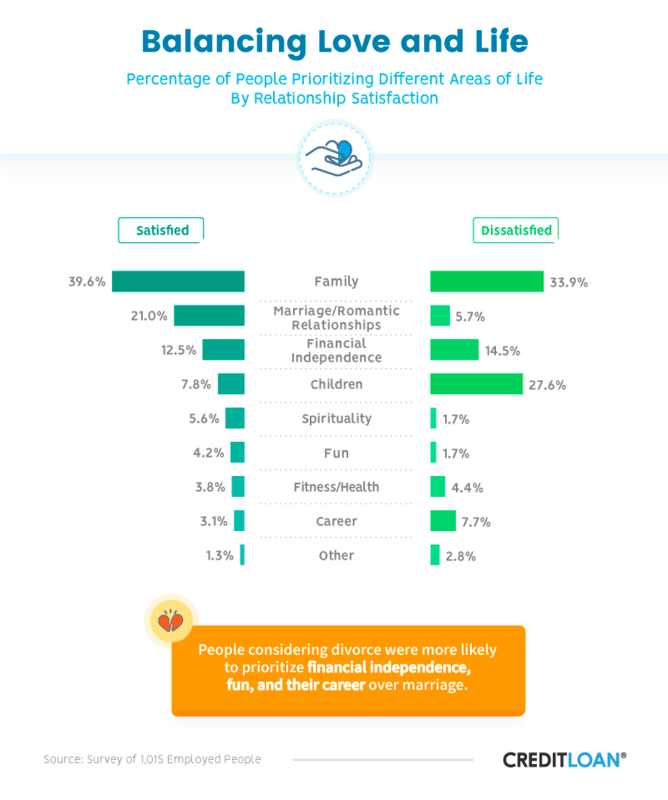 The top three priorities of people who were satisfied in their relationship were family, marriage (or romantic interests), and financial health. In fact, one major study showed doubling your social circle could have the same effect on your happiness as a 50% increase in income. As expected, those who said they were dissatisfied in their relationship prioritized differently. More than a quarter in this category said their children were a top priority, compared to only 8% of satisfied people. Perhaps there's more time for work or career aspirations when going through a divorce or separation because more than twice as many dissatisfied respondents valued their career over the satisfied group. How couples manage their finances, what they spend money on, and even which spouse is the primary wage-earner are all contributing factors for successful or unsuccessful relationships. Those in unsatisfying relationships were slightly more likely to prioritize their financial independence, which makes good sense, given that financial insecurity can lead to marital problems. But thankfully, family, relationships and financial independence take precedence over hobbies involving fun and fitness for both groups, regardless of their relationship satisfaction level. Chances are some of the findings in this study hit home, regardless of your age or relationship status. The first takeaway is this: Practically everyone struggles with finding a work-life balance, and it may not get any easier as time advances. Family is important to most everyone, and if we are willing to give up money or prestige to strike the ultimate balance, our family and children are likely the most significant beneficiaries. Just because some feel pressure to devote time to people and activities outside of work does not mean careers have to suffer. Evaluating lifestyles, careers, family, and hobbies might even lead to a higher quality of life. Using Amazon's Mechanical Turk, we collected responses from 1,015 employed people from the United States. 88.1% of participants worked on a salaried or hourly basis, 11.4% were self-employed, and less than 1% were in the military. 44.1% of participants were women, 55.7% were men, and less than 1% of participants were nonbinary. Participants ranged in age from 13 to 73, with a mean of 35.4 and a standard deviation of 10.3. In this study, we defined baby boomers as those born between 1946 and 1964. Gen Xers were those born between 1965 and 1980, and millennials were born between 1981 and 1997. The average annual income for our participants was $46,622. We weighted all data to the 2016 U.S. census for age, state, employment status, and gender. To determine relationship satisfaction, we asked participants to rate how satisfied they were with their partner on a scale of 1 to 7, with 1 being completely dissatisfied and 7 being completely satisfied. Responses of 1 to 3 and 5 to 7 were grouped, and neutral responses of 4 weren't included in the visualizations. Like what you see? We hope you will share our findings and graphics with your own audience for noncommercial purposes. When you do, please link back to this page to attribute us appropriately. Giving a little credit to those who contributed to this project can make a big difference.